Bring it on, Arsenal fans said. BRING IT ON. Bring on one of the greatest teams ever to play football. And lo, Arsenal will face Barcelona in the last 16 of this season’s Champions League. I hope Gooners are happy now. They got their wish and it will take something of a football miracle for Arsenal to make it through two legs against Messi, Xavi, Iniesta and co. They can do it, but I’d fancy their chances much more over just the one leg. Over 180-odd minutes, Barca would beat most teams nine times out of ten. It’s a tricky-looking draw all round for the English teams in fact, with only Chelsea pulling out a juicy tie, against underdogs Copenhagen; even then, the Danes will cause some problems for the creaky-looking Blues. Tottenham will face Zlatan and Milan, which should be a cracking couple of matches whoever wins (I would side with Milan, just – Tottenham’s defence is too leaky), while Man Utd face a potential stumbling block in Marseille; I might bet on the French side to go through there, as they have some dangerous players. What do you make of the draw, folks? Some real doozies there. A repeat of last year’s final no less! For me: Shakhtar, Spurs, Valencia, Bayern, Madrid, Barca, United, Chelsea. Great Draw. 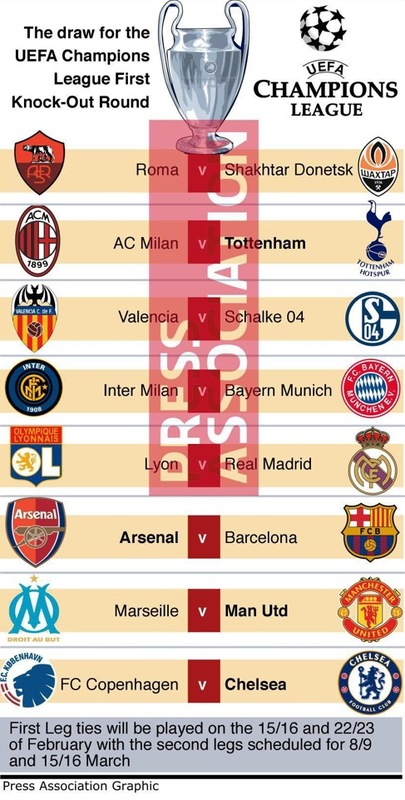 United, Spurs and Chelsea to go through and the Barca/Arsenal tie will be brilliant. Shakhtar will destroy Roma, if all their best players dont leave in January. I agree with Ted, Kobenhavn are the hot favourites against Chelski ! you recon marseille will beat man u? you’ve been on the alcoholic croissants. I was hoping Man Utd could play Barcelona but go Arsenal!